I was very unsatisfied with the baking of the ink, because i didn’t get that shiny silver after polishing. So i made a headsheild with an aluminium plate and heat shield tape on both sides from the automotive market ( for turbo engines, exausts …) . Now the results are perfect and the polishing after baikng is completely easy. 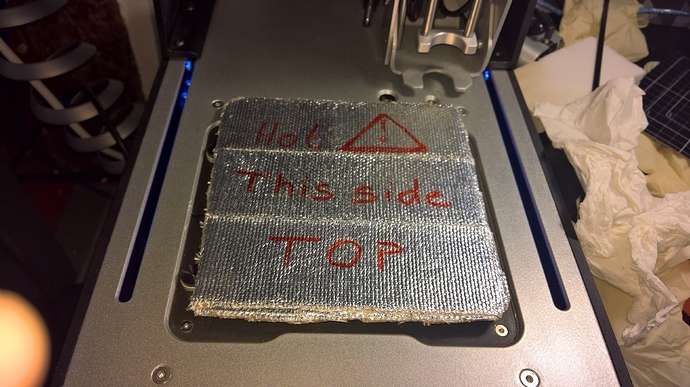 Probably it can also be used to heat up in the reflow process. It can be removed by hand (or with simple gloves) because it is Isolation the head perfect. So it can be removed to protect the components during the soldering phase in reflow. Just to confirm, when you tried curing before the additional heat shield, were you flipping the substrate upside down? That is a step that is sometimes missed. The reason we turn the substrate upside down is to get the ink as close as possible to the heated bed and ensure it gets up to temperature. Are you able to post some pictures of the type of finish you are getting now that you have been using the heat shield? I flipped the board. I will print the “Hello World” with and without shield on friday. Maybe I make a video of the polishing, because there it is quite obvious. I would be curious to see if the difference is purely cosmetic or if you actually notice a difference in the conductivity and soldering experience. It is not cosmetic. The polishing and soldering after baking with the shield is way better than without the shield. Especially the soldering (with the bismut alloy) is nearly as good as “normal” soldering on copper. If the soldering temp is at 200°C (210° for big wires) it is really nice. You can use a plate of FR1 as heat shield and experiment with it. That’ts the way i started. That sounds like an impressive improvement. Do you know what the ambient temperature is around your machine, and what sort of airflow? With an open machine like the V-one these parameters, as well as air humidity, can have a surprisingly large effect. I’ve found with my 3D printers even adding a cardboard surround to cut air cross-flow is a great aid to consistent builds.